As all eyes in the All Japan Championships were on Kento Momota, wondering whether he would make it back to the national team, Yuta Watanabe picked up two national titles. 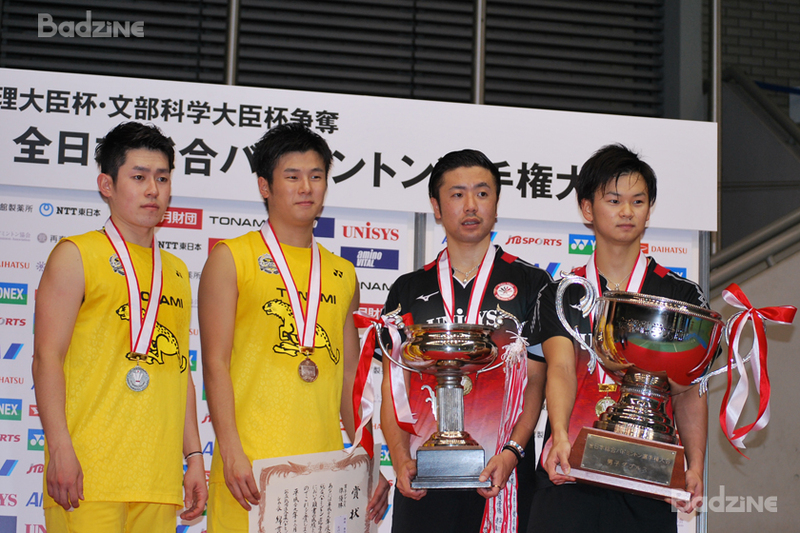 The All Japan Championships were held in Komazawa Olympic gym in Tokyo from November 26 to December 3. This tournament is a selection of the national team members for next year. 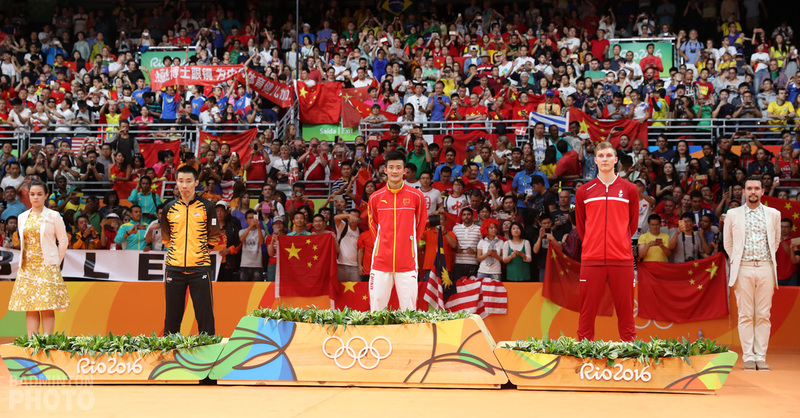 National team coaches, including a new coach in mixed doubles, were watching the matches, where even Japan’s Olympic gold medallists and World Championship medallists were participating to be selected. The first match on finals day was men’s doubles featuring former Olympian Hiroyuki Endo and his young partner Yuta Watanabe (pictured right), who had won against current world #5 Takeshi Kamura / Keigo Sonoda in a straight-game semi-final. Their opponents would be world #19 Takuro Hoki / Yugo Kobayashi, who had beaten the latest additions to the world’s top 10, Japan Open runners-up Takuto Inoue / Yuki Kaneko. Hoki/Kobayashi and Endo/Watanabe traded the first two 21-19 games. People were expecting a close deciding game like the first and the second but Endo/Watanabe got off to a good start and led 11-2. 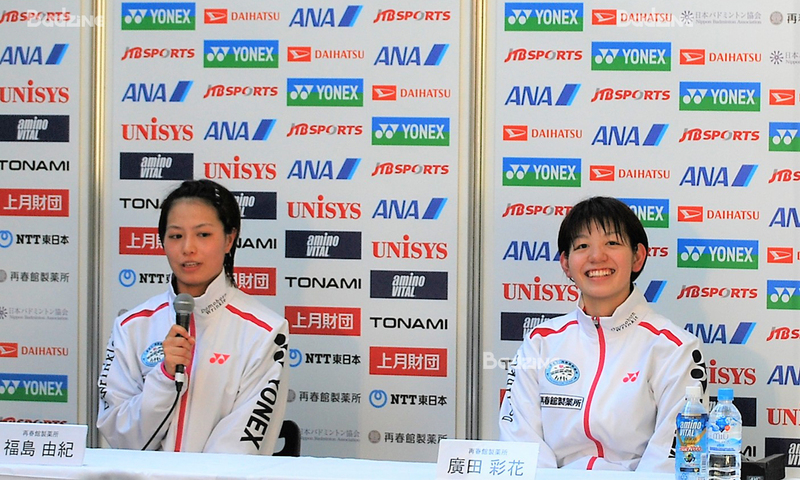 Hoko/Kobayashi couldn’t manage anything and Endo/Watanabe took the third game 21-5 become champions for the first time. The former Olympic gold medallist Tony Gunawan (pictured above, with fellow coach Keita Masuda) from Indonesia was seated behind Hoki/Kobayashi. He became a Tonami team coach from this year. He commented to Badzine after the match, “Hoki / Kobayashi had a big chance to win in the final. I saw they could play comfortably. When they lead 15-11, they seemed to play in relax. They may have been sure they would win. They just needed to focus on every single point even if they have a big lead. Anyway, I hope I can impart a lot of my experience and strategies to the team. “I also should learn more Japanese to do it,” Gunawan said with grin. In the first round, women’s singles top seed Nozomi Okuhara was on court for all of 1 minute. 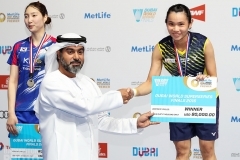 The former World Champion withdrew after her opponent scored her first point. 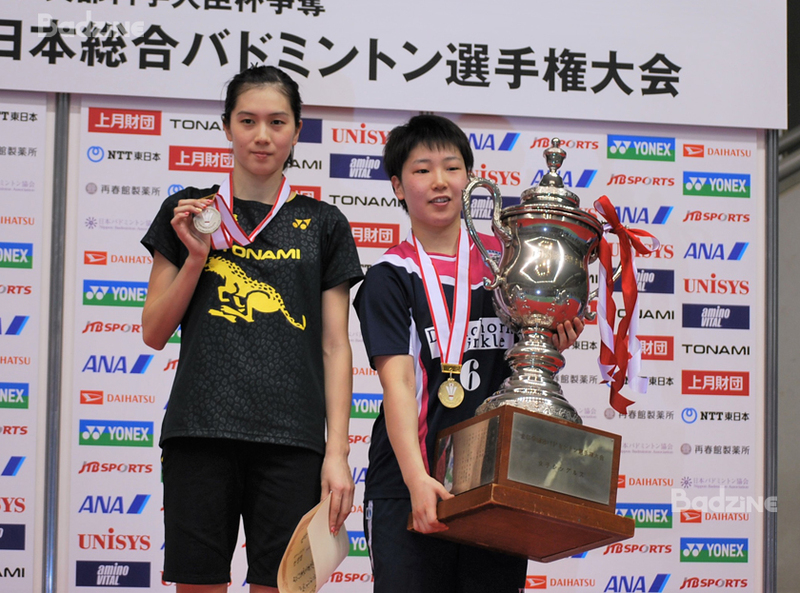 4th-seeded Aya Ohori seized the chance to reach the final after beating Minatsu Mitani in the quarter-finals. On the other side of the draw, world #2 Akane Yamaguchi beat defending champion Sayaka Sato to book her place in the final. Ohori got first game 24-22, but Yamaguchi soon evened it up. The deciding game was also close till the end. Finally, Yamaguchi grabbed the title again. However, in singles, the finalists are automatically selected to join the national A team and thus it became the first time for Ohori to join the A team. “I’m very happy,” Akane Yamaguchi (pictured) commented after match. “The match was too tough because my opponent played well and did a good job of controlling the shuttle. But I could hear the audience cheering for me so I could keep going till the end. Women’s doubles goes to Hirota/Fukushima! 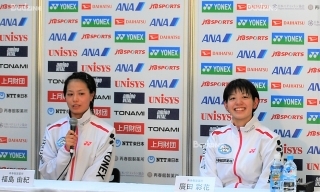 Japan’s top women’s doubles pairs are the top level in the world. 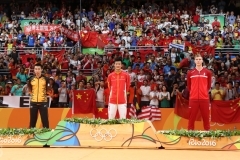 All four seeds are within world’s top 10 but there is space on the national A team for only three pairs. Top seeds Misaki Matsutomo / Ayaka Takahashi (pictured right) and World Championship finalists Yuki Fukushima / Sayaka Hirota faced off in the final. Fukushima/Hirota lead from start till the end in the first game 21-14. The second game was close until 18 points but Fukushima/Hirota kept their concentration and won 21-18. 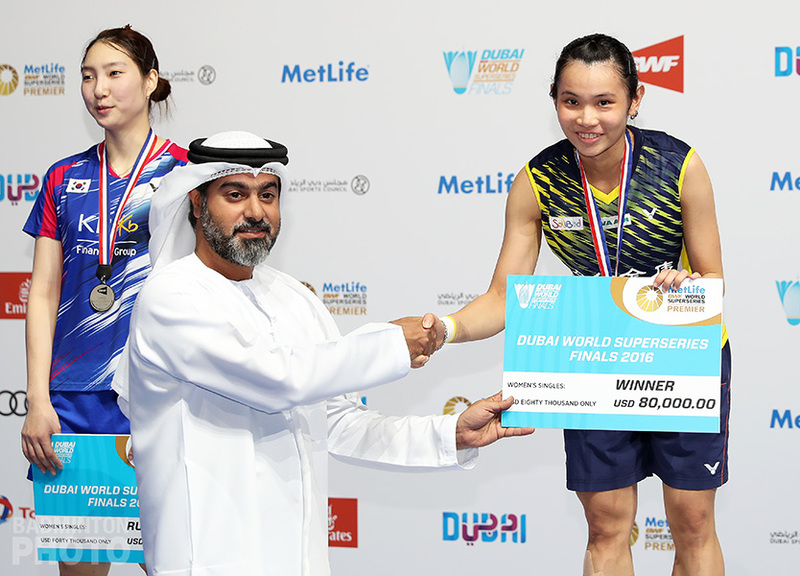 Sayaka Hirota (pictured left, with Yuki Fukushima) said, “This was our first time to play in the final in this tournament so I was nervous untill the interval in the first game. After that, I could play at my usual pace. In the second game, our opponents caught us at 18 points but we were still able to smile and say ‘We’re all right’. Kento Momota came back on court in this tournament as the #3 seed. 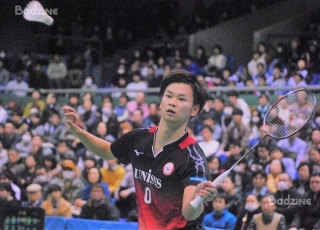 Former national team member Riichi Takeshita (pictured), aged 28, beat Momota in straight games in the quarter-final. 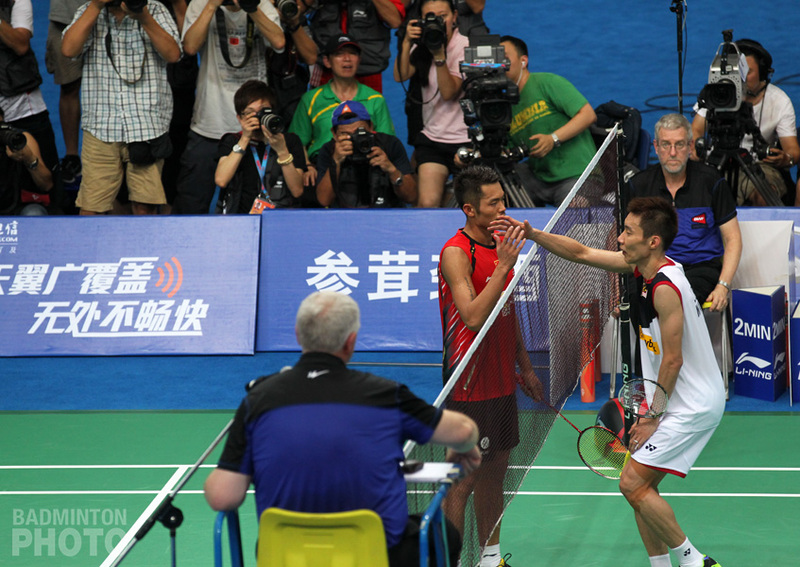 Takeshita also beat world #21 Kazumasa Sakai in the semi-final and defending champion Kenta Nishimoto in the final. 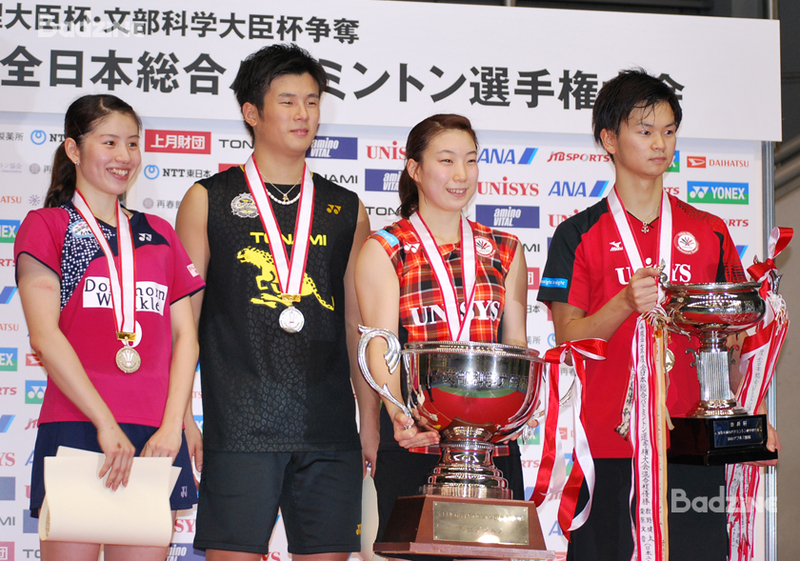 Takeshita said, “I’m happy to win this tournament. There are many players my age who have good results in international tournaments – Kamura, Sonoda, Sakai – I always cheered for them and watched them with envy. These finalists become national A team members automatically and there are two more seats for men’s singles. 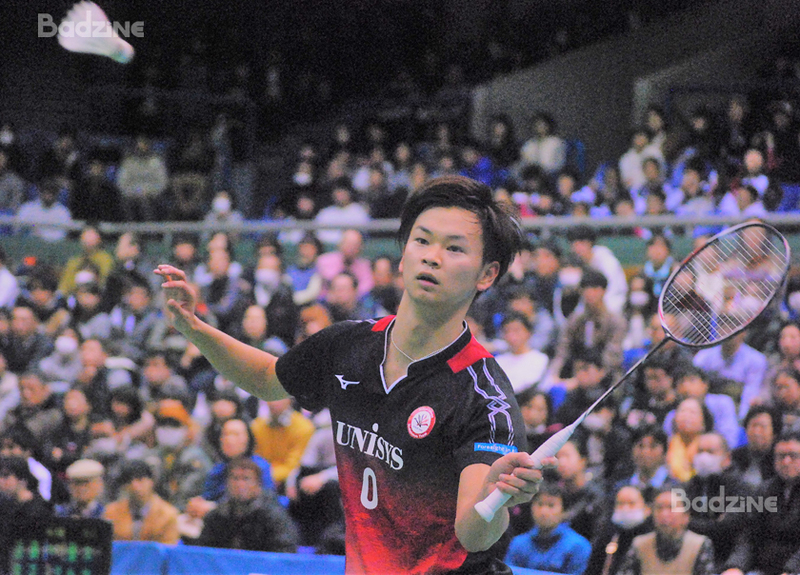 After this tournament, Nippon Badminton Association had a meeting with the national team coaches and they decided pick Kento Momota (pictured) to join the national A team for next year. Momota has reached 6 straight international finals this year and won the last 5 of them, putting him already up to #48 in the world and climbing. The last final of the day was mixed doubles. Malaysian Jeremy Gan is going to be a mixed doubles coach in Japan next year. 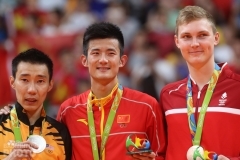 He groomed the Olympic silver medallist pair Chan/Goh in mixed doubles last year. The new coach came to watch this tournament to find some talented players in this category. Yugo Kobayashi paired up with Misaki Matsutomo in international tournaments, but in this event, he played with new partner Chiharu Shida. They didn’t have any training together before this tournament but they reached the final. Their opponents, All England semi-finalists Yuta Watanabe and Arisa Higashino (pictured), were the second place in this tournament last year. Watanabe/Higashino got a game point in the first game but Kobayashi/Shida caught them with 3 consecutive points from 18-20 down and finally won the game 23-21. In the second game and third game, Watanabe/Higashino upped the pace and won handily 21-11, 21-8. “I couldn’t train for a half of year because I had injured my back,” Watanabe said after the match. “Actually I was not sure if I could play here in two categories. I just tried to do my very best without any fear. Of course it was so tough for me both mentally and physically. According to this article http://www.badspi.jp/201712042013/ ,the number of places for single players and double pairs in A Team will increase for 2018, with 5 places for single players both men and women, 4 places for men’s double pairs and 5 pairs for women’s double pairs.